Two musicians improvising together can be imagined as a Venn diagram, where the distinct ‘musicalities’ (think personalities expressed through music) of the individuals partially converge in moments of shared experience. This is not to suggest, however, that improvisers working in this format concern themselves primarily with expanding the zone of intersection: On the contrary, playing in this way demands that each player commit to developing their distinct ideas while being open to the possibility of confluence and at the same time remaining very aware of and available to the materials being developed by their colleague. 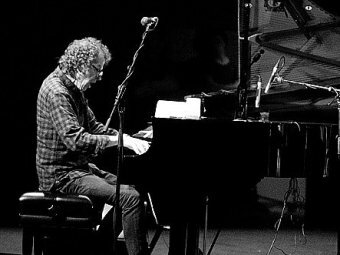 Australian pianist Alister Spence navigates these complexities seamlessly on Stepping Between the Shadows by drawing on a vast cache of timbres, textures and harmonic ideas to blur between leading and supportive rolls. Spence’s playing intelligently frames his colleague’s repeated themes in inventive ways. Spence is also possessed of an uncanny sense of when to remain harmonically static and when to imbue the music with harmonic motion. His solo piece, The Places in Between demonstrates his command of the latter. Scottish saxophonist Raymond MacDonald’s performance on the recording, though less expansive in scope, is nevertheless strong and succinct. MacDonald is very adept at creating walls of rapid notes, continuums fuelled by circular breathing. He is also fond of weaving deliberately detuned, drawn-out melodies, which create considerable movement against the static (fixed) pitch of the piano. MacDonald is able to affect his tone in other ways too, creating water-filled gurgles in The Distance from Here to There, ‘old radio’ crackles toward the end of Northern Window (A), and a static-like hiss at the very end of Found on the Way (B). MacDonald’s playing becomes a little less convincing, however, in the moments when he refers to the jazz idiom. There is something in the way he articulates and the sound that he generates in these instances that belies that his playing is not steeped in the traditions of jazz (this is most apparent on Found on the Way (A), on which he plays the alto saxophone). This is by no means a ‘deal-breaker’, however: I simply raise the observation as some listeners may find these moments a little out of place. To return to our Venn diagram metaphor, it is worth noting that the shared history of our two circles is not one of life-long intimacy, and nor are they meeting for the very first time. 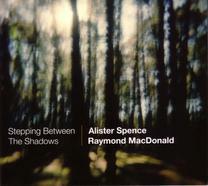 Stepping Between the Shadows is a convincing document of the sporadic, trans-continental relationship between Alister Spence and Raymond MacDonald that spans some ten years. Recorded live at the Concert Hall, Glasgow University, February 2011.